Deputy Minister of Science and Technology Tran Van Tung, speaks to Hải Quan (Customs) Online about how to differentiate genuine goods from fake products. What should Vietnam do to co-operate with other countries to prevent trade fraud and fake goods? What advantages and disadvantages does Vietnam have in the fight against trade fraud and fake goods? Vietnam has adopted legal documents to tackle trade fraud, including the Law on Intellectual Property Rights, which is similar to other international laws. The General Department of Viet Nam Customs is a very important State management agency in the fight against trade fraud and fake goods, particularly at border gates. 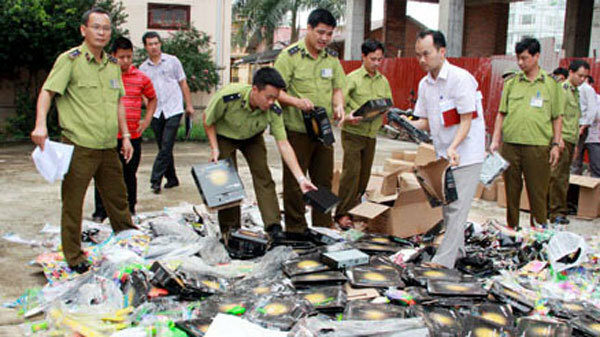 Their mission is to detect and prevent the illegal import of fake goods to protect Vietnamese consumers and enterprises. However, to deter the infiltration of fake goods, customs offices have face many challenges. To recognise whether goods are fake or not, I recommend looking at the trademarks. For example, Vietnamese goods are stamped with 893. Besides the trademark, each product also has a QR code. By reading the QR code, we can find out where the goods came from.